This is what I would call an impressive knee jerk reaction to the recently passed and enacted Safe Carry Protections Act here in Georgia. The new legislation basically says properly licensed gun owners can carry a properly registered gun pretty much anywhere they want. This includes bars, churches, stores, schools and some government buildings. 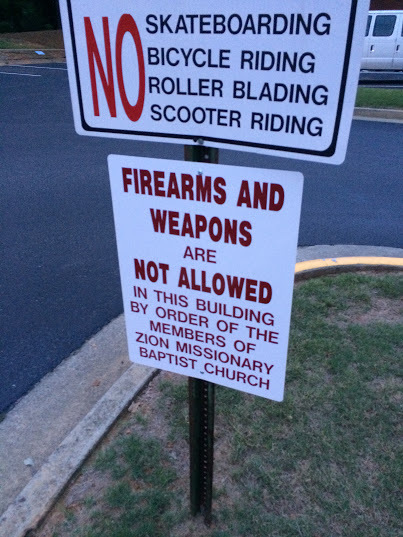 I personally am not a fan and from the looks of it, neither is the Zions Baptist Church. I'm thinking this is a statement but maybe it's just another sign of our sign culture gone wild. Either way, the fervor with which they have posted signs on their property is both equally impressive and depressing. Oversigning for any reason cheapens our public realm and reduces the connection and intimacy that one feels for a place. I counted no fewer than 20 signs and I snapped pics of most of them. 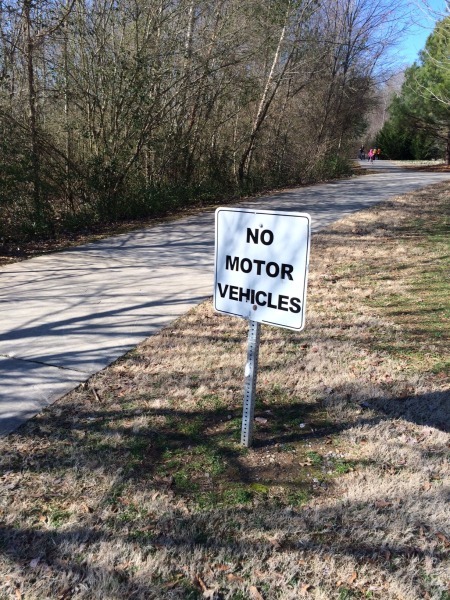 Have fun with my photo anthology of hideous signs posted in reaction to a ridiculous law. I didn't go inside but I wouldn't be surprised to see a sign posted on the cross hanging over the altar. I'm not sure if this registers as overkill or as OVERKILL. Do we really need three freaking signs stating the same thing at the intersection of Mansell Rd and Crossville Rd? Bad signs are everywhere.. Even at Seaside, which is one of the design meccas of America. I stumbled upon this pic while I was walking around yesterday. I think there' s a little more room at the bottom of this sign pole for another sign but I'm not sure they could get any crappier than the one they added most recently..
Maybe we're not as safe as we think if our city feels the need to plaster the landscape of our parks with bright yellow signs warning that your valuables aren't safe in your car. At this point, I think we need a new sign that will pretty much cover everything for the city..
STOP THE MADNESS!!! Stop cheapening our public realm with wholly unnecessary signs.